Leading Manufacturer of metal detector tablet deduster, tablet metal detector and capsule metal detector from Mumbai. 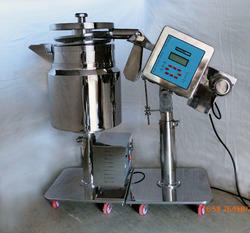 Tablet Deduster Metal Detector (GMP Model-SMS-06), which is helpful in detecting sleeves or any kind of metals if present in tablets and capsules. Available in different configurations like angular, round or flat or door frame structure, these detectors are ideal an array of product types and conveyor systems. In addition to this, our customers can avail this product from us at affordable prices. Our range of process machinery includes Tablet Metal Detector (GMP Model-SMS-06), which is helpful in detecting sleeves or any kind of metals if present in tablets and capsules. Available in different configurations like angular, round or flat or door frame structure, these detectors are ideal an array of product types and conveyor systems. Our range of process machinery includes Tablet Metal Detector(GMP Model-SMS-06), which is helpful in detecting sleeves or any kind of metals if present in tablets and capsules. Available in different configurations like angular, round or flat or door frame structure, these detectors are ideal an array of product types and conveyor systems.